Jon Stewart (born Jonathan Stuart Leibowitz) is an American comedian, satirist, actor, writer, Pundit, and producer. He is best known as the host of Comedy Central’s The Daily Show and for his political satire. Librarian Note: There is more than one author in the GoodReads database with this name. See authors with similar names here. Stewart started as a stand-up comedian, but later branched out to television, hosting Short Attention Span Theater for Comedy Central. He went on to host his own show on MTV, called The Jon Stewart Show, and then hosted another show on MTV called You Wrote It, You Watch It. 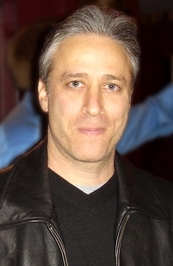 Stewart became the host of The Daily Show on Comedy Central in early 1999. He is also a writer and co-producer of the show. After Stewart joi Jon Stewart (born Jonathan Stuart Leibowitz) is an American comedian, satirist, actor, writer, Pundit, and producer. He is best known as the host of Comedy Central’s The Daily Show and for his political satire. Stewart became the host of The Daily Show on Comedy Central in early 1999. He is also a writer and co-producer of the show. After Stewart joined, The Daily Show steadily gained popularity and critical acclaim leading to his first Emmy Award in 2001. 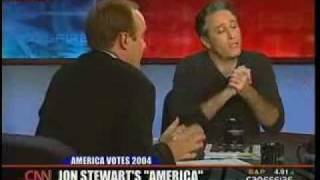 Stewart himself has also gained significant notoriety as a vocal, outspoken critic of the Bush administration and of personality-driven media shows, in particular Bill O'Reilly and the Fox News Channel. Critics say Stewart benefits from a double standard: he critiques other news shows from the safe, removed position of his "mock news" desk. However the validity of this distinction is challenged by a number of critics, researchers, and even supporters, some of whom have awarded The Daily Show with news and journalism awards. 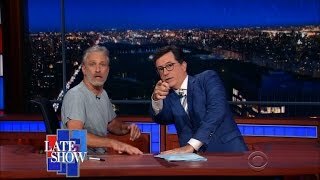 Jon Stewart isn't a Goodreads Author (yet), but he does have a blog, so here are some recent posts imported from his feed. John Oliver negotiates with the Palestinian ambassador, Republicans insist they love Israel more than Barack Obama does, and Sean Hannity exposes Barack Obama. Does your FAVOURITE AUTHOR have a FAN PAGE?